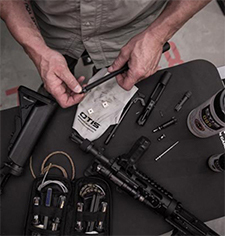 Otis prides itself on manufacturing compact, lightweight, easy-to-use gun cleaning equipment and accessories. All of our cleaning systems follow the Breech-to-Muzzle® cleaning principle where fouling is pulled out in the direction the bullet travels. This prevents additional fouling depositing in the action. 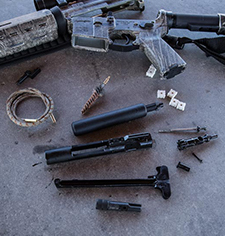 Our cleaning systems feature Memory-Flex® cables which allow for Breech-to-Muzzle® cleaning without disassembly. 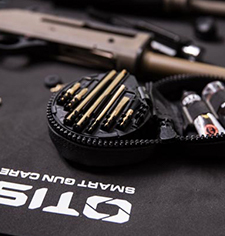 The coated cables and brass components won’t scratch your firearm and the 100% cotton patches are proprietary and offer a more complete cleaning. Repeat as needed. See the instruction sheets below for more information on the complete process, as well as additional instruction on our specialized cleaning tools. We designed our circular patches to ensure that your barrel is getting the best possible clean with 360 degree coverage. Insert the slotted tip into the slot on the patch, take a pinch on the patch, and feed it back through the slotted tip. Pull the patch up and around the slotted tip and you’ve got 360 degrees of patch-on-barrel contact. Add a few drops of CLP for a more complete clean. Which Patch Do I Use? The small caliber patches are ideal for cleaning .17 caliber through .223 caliber firearms. Each patch can be used up to 6 times by utilizing the different slots as well as flipping the patch over. The 3" All Caliber Patch cleaning patches are unique in that one patch cleans all firearms from .243 caliber to 12/10 gauge. Each patch features inner and outer slots, giving you complete control over the size of your finished swab. Use the outer slots for .243 caliber and larger and the inner slots for .30 caliber and larger. Each patch can be used up to 6 times by utilizing the different slots as well as flipping the patch over. Add your patch saver over your patch; take a pinch on the patch, feed through and pull tight. 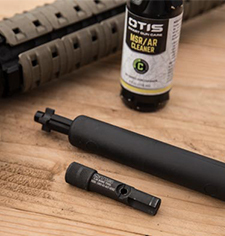 Otis features both large and small Patch Savers ® to get your patch up close and personal with the inside of your barrel.Use the small Patch Saver ® for 20, 28, and 16 ga. and the large Patch Saver ® for 12 and 10 ga shotguns. What Size Pinch Do I Take? The closer to the slotted tip you pinch, the smaller your swab will be. When learning to tie an Otis patch, tie a smaller patch first to get comfortable with the method. 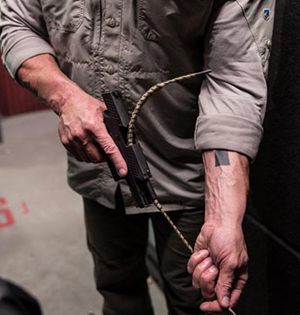 If the patch feels too loose on the barrel, tie a slightly larger patch until reaching the desired size. See the instruction sheets below for more information on the complete process, as well as additional instruction on our specialized cleaning tools. © Otis Defense. All rights reserved.